One of the most wearable parts on your garage door are the garage door cables. These cables are designed to lift the door from the bottom corners of the door and are connected to your counter-balance spring system. Due to the amount of tension running through the cables, they are likely to wear and fray over time. If the garage door spacing is not correct the cables may rub on the panels and tracks resulting in premature wear and fraying. Viking Overhead carries the best quality cables we can find! 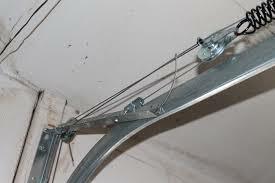 Having a cable break on a garage door can be very dangerous resulting in the door falling on a person or vehicle. This is one of the most important items that should be inspected regularly. 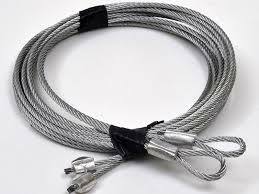 Quality garage door cables are made of high strength stainless steel. There are several garage door cables that come in different lengths and thicknesses depending on your door. We always carry the cables you need and pride ourselves in keeping all sizes on the truck at all times! Garage Door Cables are also known as Aircraft Cable. 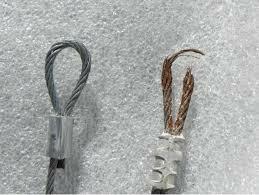 Aircraft Cable is generally made of either stainless steel or galvanized steel. This type of cable is rated for a specific weight limit and given a “Minimum Breaking Force in lbs” based on the amount of strands in the cable. A stainless steel cable is known for being a better quality cable. 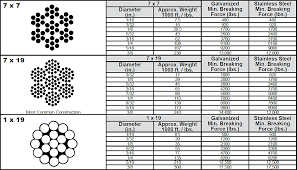 However, if you notice the chart on this page you will see that a galvanized aircraft cable is actually rated with a higher breaking strength in lbs. There are 2 popular and well known cable strand types used regularly. The first is a 7X7 design. A 7X7 cable has 7 separate strands that are each independently made up of 7 strands. The second and most common aircraft cable is a 7X19. This design is the same exact concept as the 7X7 except in this case you would have 7 separate strands that are each independently made up of 19 strands of wire. We know the cable length can be very confusing. Lets say you have a standard 7 foot tall garage door. Although some would call the cables your door requires 7 foot cables, they’re not actually 7 foot. The cable must be longer than the door is tall in order to wrap around the torsion drum located near the header and horizontal track. A standard 7 foot tall door requires cables that are 8’6″ long. 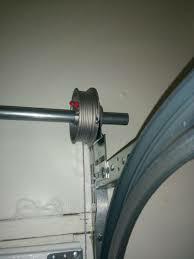 Garage Door Cable also has a variety of diameters that are measured in fractions of an inch. The most common garage door cable will come in either 1/8″, 5/32″, or 3/16″ on residential doors. It as also common to see cable used for garage door opener chains, particularly chamberlain chain drive openers. If you have any further questions or would like to schedule a technician to inspect or replace your garage door cables give us a call at (817) 600-4224.